KTMtwins.com KTM Motorcycle and Product News: KTM 690 Enduro and 690 SMC Touring Windscreen in stock now! KTM 690 Enduro and 690 SMC Touring Windscreen in stock now! I know you have been waiting for them to finally arrive from KTM and now they have. 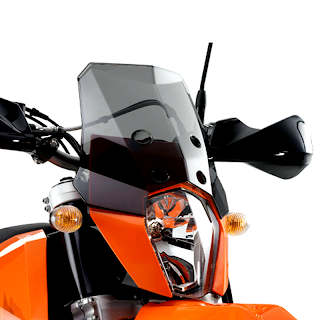 We just took stock on a large quantity of the KTM 690 Enduro and 690 SMC Touring Windscreen. Tinted to keep the glare out of your eyes and just tall enough to block that annoying wind on long enduro rides. Simple to install and effective in it's design pick yours up now before they go out of stock. Fits earlier models but does not fit the 2009 690 Enduro R due to changes in headlight shape going from 2008 to 2009.